Do you provide service to thousands upon thousands of people through your telecom towers? If so, you know just how important reliability is. It doesn't matter where your towers are - in rural or in urban areas - your customer counts on you for reliable coverage. For so many people, wireless coverage is a huge part of their everyday life. For that reason, they aren't forgiving when your service lacks quality. One offline tower can make the difference between happy customers and losing them to your competitors forever. Are you wondering how you can ensure the reliability of your telecom towers? A good remote monitoring system gives you visibility over all of your equipment and tower sites. Monitoring equipment at your tower sites quickly pays for itself. Advanced remote site monitoring equipment can quickly notify you when something is wrong through automatic, detailed alerts. Why Should You Monitor Your Telecom Towers? The first and most important reason for you to monitor your tower sites is: to not let your customers be the first ones to tell you about a network outage. When you're the first one to know about any problems occurring with your equipment, you're protecting your revenue. There are, however, other issues not directly related to your towers. Most microwave sites are really remote. Of course, a common equipment failure is a problem, but fixing it promptly will minimize the impact on your revenue. Copper theft, though, is a much bigger concern. It takes a long time to fix. Also, replacing and paying labor costs to reinstall copper is expensive. This is equally true for any other kind of theft and vandalism. To avoid FCC/FAA fines for non-compliance, your lights must be kept online. Any lighting failure must be reported immediately to minimize your risk of fines and liability. Problems like these are the reason why you need instant notifications about any issues at your sites, and deploying a competent remote monitoring system into your network is the way to go. In this copper theft monitoring system, door and motion sensors report to the local NetGuardian alarm remote, which then triggers image capturing from the SiteMon IP cameras. All alarms are reported to the T/Mon master console at your central office. You can also receive text messages or email alerts. What If Your Tower Is Less Than 150 Feet Tall? Your towers don't need to be more than 150 ft (or whatever height your local regulators enforce) to be monitored. As a matter of fact, monitoring protects everything at the tower site, not only the tower lights. Physical safety of the building, and immediate alerts for events such as fire or electrical outages should be monitored. Important communication equipment, such as switches, routers, fiber optic equipment, and microwave radios are common at tower sites. Without proper monitoring, there's a risk of gear damage and theft. Your monitoring activities should include controlling physical access and preventing theft with the use of a Building Access System, with integrated video surveillance. What Should You Be Monitoring at Your Tower Sites? The secret to achieving effective operating conditions for safe and reliable service is to make sure that all of this is running correctly. Interference with any of these key elements may cause serious problems and massive costs. How Do You Know If You're Prepared for Tower Site Failure? It's always better to be safe than sorry. As I said before, it's really important to be prepared for the worst: break-ins, equipment failure, tower light failures, and fires. To prevent and/or handle these problems in a timely manner, it's essential to deploy a competent remote monitoring system. A typical system is composed of a fleet of Remote Telemetry Units - or simply RTUs. They collect alarms from your microwave communication equipment and send them to your alarm master. These units are a crucial part of your monitoring system, because they provide your alarm master with the data it needs to inform you of an outage via email or text message. To be able to deal with tower site failures, it's essential to find a remote monitoring system that is equipped with all these features. Automatic notifications will deliver to you the information you need in a timely and effective manner. It's crucial to have this information at your fingertips - whether you're in an office or not. Dial-up and LAN connectivity with a web browser interface is the most cost-effective and convenient way to collect alarms. UPS (short for Uninterruptible Power Supplies) for RTUs make sure that you'll always have these monitoring and notification capabilities. What Should You Look for in an RTU for Your Telecom Site? When looking for an RTU vendor, it's important to remember that, although there are many RTU manufacturers in the market, most of them won't give you a perfect-fit device for your facilities. Some units will be built for corporate IT environments in air-conditioned data centers, not for remote industrial mountaintop sites (or vice versa). Some other devices won't support the type of transport or protocol you need. What power voltage do you have available at your tower site? Most likely, it won't be 110 VAC, so plain "IT" RTUs won't be a good choice for you. Find an RTU that supports -48 VDC, or +24 VDC, or that can be personalized to support whatever you need it to support. How much rack space do you have available? Is it 19" or 23" wide? If the rack is full at your site, can you mount the device on a wall? Get an RTU that you can accommodate physically. How many contact closures do you have in mind? How many analog signals do you need to monitor? Will you only need a single temperature sensor or do you need to mount several throughout the facility? You need monitoring hardware that can cover all the vital gear and environmental conditions at your tower site. Do you have equipment that can be managed with contact closures? If so, you'll want an RTU with control relay outputs to cover each piece of your equipment. Make sure to find a remote alarm device with the right outputs for what you need. Is your analog microwave transmission gear old? Do you need serial connections for them? 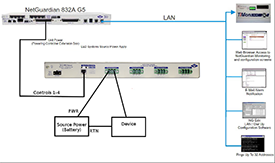 Do you have IP overhead channels on your digital microwave? All of these possible scenarios require a different RTU transport. Dictated by your transport capabilities and alarm master, you need to choose a compatible protocol. You might need an older one, such as TL1 or TRIP, if you have older gear still in use. However, you probably want something newer if possible, such as SNMP or DNP3. It's extremely important to make sure your RTU supports the necessary protocols to communicate effectively in your specific network. Can You Really Expect to Be Able to Find an RTU That Meets All Your Requirements? What other companies with tower sites have deployed their gear already? Are your possible vendor's clients happy with their outcome? Do you have easy access to testimonials and reviews? Do they provide you with references that you can call to hear their thoughts? Never ever just take the manufacturer's word for it. You'll most likely be able to find a 90% match for what you need, but one part may be missing. It's probably going to be hard to find an off-the-shelf product that will meet your requirements 100%. If you don't want to sacrifice capabilities on your device, then you'll need a manufacturer who will adjust their design to fit perfectly to your spec. Your full-service vendor must give you a totally proven design in a configuration that meets your needs. Do You Really Need a Master Station? Good RTUs are essential for your remote monitoring system, and you'll probably be able to manage them yourself if you have fewer than 10 or 12 units. With just a few facilities, you can have your RTUs send you text messages or emails when there's something wrong. Protocol compatibility simply means that your master station must be able to interpret whatever protocol your RTUs and other gear use. A common protocol in tower sites is SNMP, as well as DNP and Modbus. Your network is important. Your clients depend on you. It's not worth it to blindly take a risk to test your manufacturer's new equipment. Buying custom designs is okay, just make sure that the individual elements being put together have all been proven in the lab and in the field. When you're buying a master station, pay attention to total cost of ownership. Sometimes vendors can offer you something that's apparently cheap, but then you're stuck getting nickeled and dimed every time you need to add a new monitoring device. Paying (once) for individual protocols is okay. That's a large design decision, after all, and you wouldn't want to pay for a bundled protocol you'll never use. However, paying for each and every new device you add to your network is silly. You own your network. Don't let your monitoring manufacturer take that away. Let's say that you have 20 sites, so you almost definitely need a master station. Be careful with what you choose, though. You definitely don't need a master that is designed to handle thousands and thousands of sites. Avoid paying for a lot of capacity you'll never be able to use. Look for a master that has some levels of capacity and price to choose from, and choose what you need now and for your reasonable growth in the future. Think about your upgrade path. If you have big growth planned for the future, you can choose a master station that's the next size up from what you need right now. Since you're sticking with the same manufacturer, your migration and training expenses should remain minimal. Protocols and user interfaces will basically stay the same. Look for vendors that offer upgrade discounts. Does your prospective vendor offer easy upgrades? It's always a good sign when vendors believe that their products are useful enough to help their clients expand. Your manufacturer for your telecom tower gear is good at what they do, but they're not experts in remote monitoring. This means that they'll give you just enough so they can say "equipped with monitoring" on their features list. Will "self-monitoring" equipment have the intelligent capabilities you need to efficiently manage your network? Can it track analog values, such as temperature? Can it track generator fuel consumption over time? Well, probably not. With integrated monitoring, your equipment will be monitoring itself. What happens when it fails? If you want superior reliability, then you should consider purchasing an RTU. The independent monitoring that the RTU provides you can also have backup transport, such as cellular, to go around a microwave failure. Imagine that your LAN has expanded or you're upgrading to new microwave hardware. What will happen to your monitoring? Will you buy a brand new monitoring system for every site? Will you keep your old transport gear powered up only because of its telemetry? These are mediocre options. Purchasing an RTU eliminates these problems, so don't wait until you're in a difficult spot. Set up your monitoring system on your terms and on your own timeline. In a nutshell, it doesn't really matter what RTU you choose to compare against embedded "self monitoring". You'll be in better shape with almost any dedicated RTU available vs. using embedded monitoring built into your network system. How Will You Justify the Costs of Monitoring Your Tower Sites? Sometimes, it's hard to convince management to allow budget money for buying a remote monitoring system. After all, it's not the kind of purchase that will directly affect your revenue (even though it indirectly does in a big way). However, what your company needs to keep in mind is that alarm monitoring for your tower sites is actually an investment that will help you avoid unnecessary expenses. As you know, FCC fines for tower light outages, windshield time, and downtime are costly. All of this could be prevented and avoided with high-quality tower site monitoring. Not to mention that a reliable monitoring system will provide you with other benefits, such as more visibility over your systems, more control over site devices, and more reliability for you and your customers. Why Not Start Protecting Your Telecom Towers Now? It's one thing to know that your tower sites need to be monitored, but it's a completely different thing to know how to monitor. At DPS, we help you solve this "how" issue. We have advanced RTUs that can be tailored to suit your tower and equipment monitoring requirements, integrating perfectly with your existing gear. The NetGuardian 832A G5 is a good example of a high-capacity RTU that can receive alarms from a variety of equipment and report it to your master station. Your NetGuardian will send you detailed notifications 24 hours a day, so that you'll always be the first one to know of any trouble. Do you need a master station to keep track of all the RTUs at all your tower sites? Our T/Mon is a multi-protocol master that supports more than twenty-five open and proprietary protocols. It doesn't matter which "language" (protocol) your RTUs or other vital equipment use, T/Mon will be able to communicate well with them - and it'll be doing this from your central office. Safety can be a major concern as well. We offer you the Building Access System to help with that. This system makes sure that your site remains secure when no one is supposed to be there. Protect your site from copper theft, break-ins, and vandalism. With keypads, door sensors, and security cameras, you'll know exactly who has been at your tower sites. In this application, your doors are being controlled with proxy readers and/or keypads. Those entry devices are connected to an ECU G3 (Entry Control Unit), which decides whether or not the door should be unlocked after an entry attempt. The ECU communicates back to the NetGuardian 832A RTU that is also monitoring equipment alarms and environmental sensors. The NetGuardian pushes user profiles into the ECU. User profiles are originally databased into the system from the central T/Mon master station. It doesn't matter which challenges you're facing. We've just about seen it all. We can work with your specific requirements to help you achieve a perfect-fit solution for your remote monitoring needs. Don't hesitate to start your path to better network visibility, call DPS today.